This project involved book design for print from the supplied Word document. Along with formatting the text, we optimized the images for print and created captions. 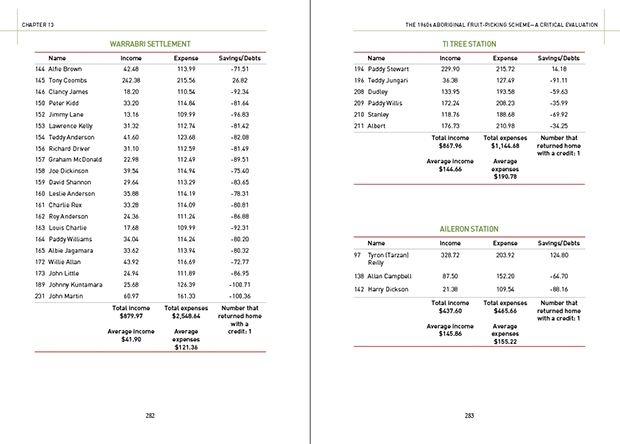 An entire book layout was created, using paragraph styles to ensure that consistency was reached. It was a complicated book as there was a large section with over 15 tables. Once the final files were approved, we then created print-ready pdfs and uploaded the files to our print-on-demand supplier. 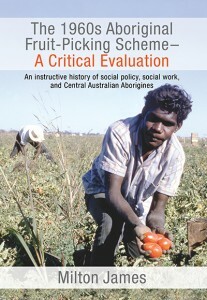 This book provides the untold history of the 1960s Aboriginal fruit-picking scheme, which involved hundreds of Aborigines living on missions and government settlements in Central Australia. When the fruit-picking scheme was being developed, a new, so called “progressive” ideology was sweeping across Australia. This new ideology put an end to this and all other similar schemes. The same ideology that swept this scheme aside turned these remote missions and settlements into permanent communities. Coupled with an increase in the settlement training allowance—euphemism for a welfare payment—these communities strengthened the culture of dependency and passivity, and reversed what little economic incentive these people had to leave these institutions and build independent lives for themselves. To find a way forward we must first understand the past. The history of the 1960s Aboriginal fruit-picking scheme—and the events that put an end to it, building in its place “outback welfare ghettos”—will provide important missing gaps in our understanding of where it all went terribly wrong. From this understanding comes the knowledge of what we have to do to turn this situation around for the better. In 2005, Milton James—a not so ordinary social worker—put ideology to one side and took up a common-sense approach to overcoming the disparity between Indigenous and non-Indigenous Australians. The results were outstanding. Milton had thought he had embarked on something new, but he was to discover that he was repeating what worked in the past. 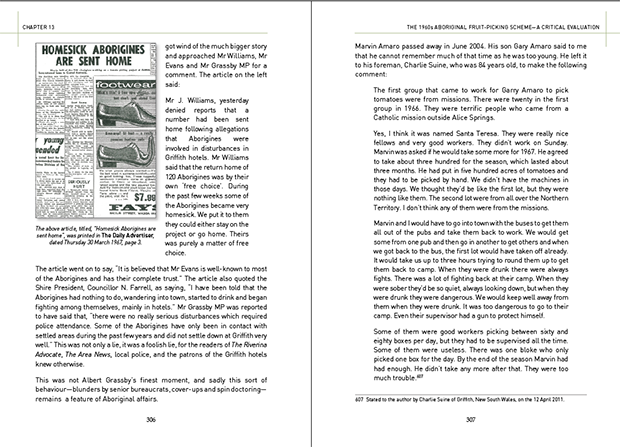 This book is the result of many years of painstaking research and the necessity to travel thousands of kilometres to uncover the almost forgotten history of the Aboriginal fruit-picking scheme.